The Qfor Method is a modular system of Quality Evaluation and Certification of Training Institutes and Consultancy firms. It is based on client satisfaction research and/or analysis of organizational processes and resources. Qfor “Process Scan”: Audit of processes and resources: How does the organisation work, which are the resources and how are they used? Qfor “Client Scan”: Audit of Client Satisfaction: Are former clients satisfied, how do they evaluate the key aspects of the services they received? 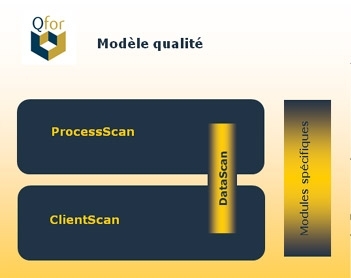 The Qfor Method is a modular system: Each evaluation approach (Qfor ClientScan or QforProcessScan) has a module containing elements recognisable in all organisations, training institutes and consultancy firms. This common module can be modified with sub-modules specific to the needs of a sector, region, association or consultancy firm and so create an individual approach. The Qfor Method is an improvement tool. It offers possibilities to develop improvement stategies through self evaluation and Benchmarking. The Qfor Method is multinational on European level. It was developed with the Financial aid of the European Commission in the context of the Leonardo Da Vinci Programme. It is being implemented in Belgium, Spain, France, Italy, Portugal and the Czech Republic. The Qfor Method is usable for most organisations: Training Institutes and Consultancy Firms often are small and medium sized companies. The preparation and execution time for a Qfor Audit is much shorter than for other similar evaluation or certification systems. This time saving exists for the auditor as well as for the personnel of the firm which is to be audited. The Qfor Method makes use of the latest technologies not only for the collecting and processing of information but also in the presentation and the use of results.